①High lighting clear acrylic frame to provide a magic visual effect. ② Bevel display angle for a better display angle to attract customers' attention, and display angle can be adjusted by the unique design. ③ The poster display stand can be put in anywhere and easy to change the position. ④ You can change the display graphics in seconds. ⑤ Main for indoor advertisement,such as shopping malls,markets and bus stations. ⑦ Steel base to improve the stability. Customize is available to fit to unique using circumstances and requirements,we can change the design according to your needs to meet you requiry. 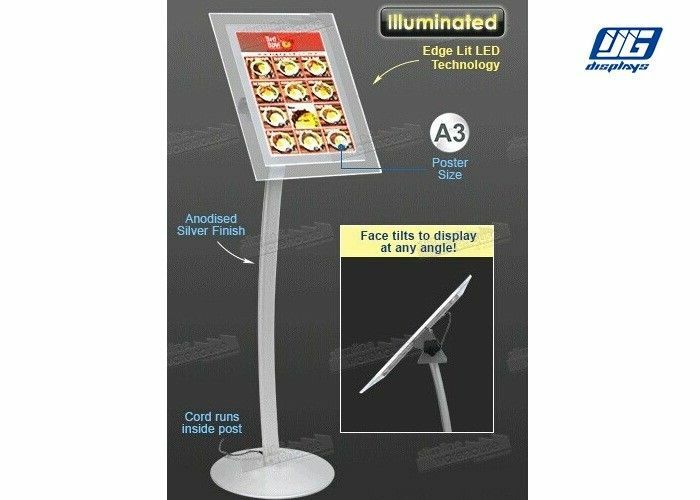 ① Silver A3 Illuminated LED Bevel Poster Display Stand can be packed with corrugated box or honeycomb box according to different shipping needs. Over-10-year expericence are in accord with your assurance and recognition of our high quality Silver A3 Illuminated LED Bevel Poster Display Stand.